To secure the supply of top class products to its customers the company operates some 200 quarries in Europe producing high quality material such as limestone, granite, gneiss and granulite. According to Uwe Posdzich of the department of drilling and blasting at Mineral Baustoff, Strabag insists on products that not only meet demands for quality and cost efficiency, but also stringent operational requirements as well as modern standards of sustainability. And it is this policy, he points out, that is the prerequisite for a successful business relationship. When it comes to drill rigs, quality and durability are also important characteristics says Posdzich, but the most important factor is proven service. Mineral Baustoff’s purchase of a FlexiROC T45 was mainly due to the rig’s low fuel consumption and the outstanding quality of the boreholes it produces. The FlexiROC T45’s ability to collar the holes with extreme accuracy resulting in excellent hole straightness proved to be decisive, especially when compared to other, comparable drill rigs. Prior to making its purchasing decision, Mineral Baustoff put drill rigs of several different makes to the test. Each supplier drilled a hole in the same geological formation to ensure the comparison would be as fair as possible. During the test period, the FlexiROC T45 outperformed the other drill rigs in terms of both fuel consumption and borehole quality. Furthermore, the FlexiROC T45 also presented the best user-friendly experience. Mineral Baustoff was also impressed by the Atlas Copco telematics system CERTIQ, which provides the user with real time machine data such as drilled meters, fuel consumption and location. This enables owners to monitor and optimize internal operating processes. The Atlas Copco GPS system also helps the rig operator to drill parallel holes, thereby ensuring optimal blasting results. Another issue that strengthens the relationship between Mineral Baustoff and its supplier is Atlas Copco’s comprehensive range of equipment. 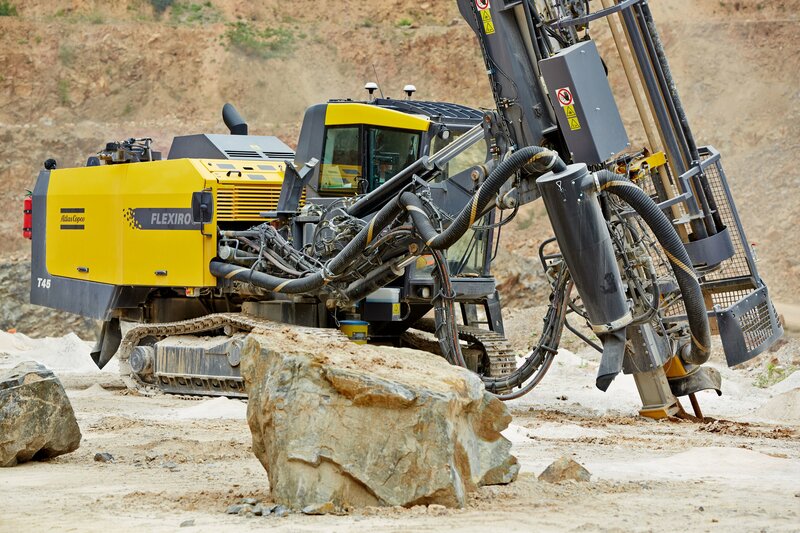 Mineral Baustoff not only uses Atlas Copco drill rigs but also the company’s robust range of rock drilling tools. The flexible and versatile tophammer FlexiROC T45 drill rig has been designed for high performance in demanding drilling applications. Field studies have shown that it requires up to 50% less fuel than the previous model. Atlas Copco’s Telematics Software Certiq compares and communicates machine via 3G, GPRS or satellite to a local server in a quarry or mine which sends the data to a central server. The collected data can be retrieved at any time via a web portal.